How does Ametek Solidstate Controls (B/W Controls) compare to Waterline Controls? Waterline Controls stands apart from Ametek Solidstate Controls in several key areas. The brand name owned by Ametek is B/W Controls or B/W Level Controls. B/W Controls provides third party companies different modules of level control Printed Circuit Boards (PCBs)which use conductivity between probes as the technology and that are UL recognized. These third party companies now assemble the various parts, along with PCBs, into level controls for a specification. While some of the pieces in the third party controls may be UL recognized and the shop may be a UL Shop, it does not mean that it has been tested and evaluated as a completed system like a Listed Product. Rather to say these two things only provide proper construction and proper spacing of the control panels construction. Waterline Controls builds products engineered for specific applications. WaterLine Controls carries an ETL Listed status which means the whole system, including the sensors have been evaluated by a third party to meet a Standard of electrical construction and use. 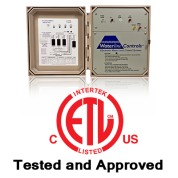 WaterLine Controls is tested to UL Standard 508 which is a controls Standard for industrial controls. Waterline Controls does not use conductivity between probes as its sensing method and so the probes do not foul or deteriorate no matter the quality of the water. Read more about conductivity sensors to compare our key points and what makes us unique!